The Boeing 747-48EF cargo plane was on approach to runway 25L at Frankfurt International Airport, Germany. In the area of the outer marker to runway 25L at a height of 1400 ft AMSL the landing flaps were moved to the 30° position. The approach speed at this time was 160 kt (IAS). Shortly after actuating the flap lever, the crew heard an impact sound and noticed vibrations. The plane rolled about 1° to the left. The autopilot levelled out the incline and the aircraft continued its approach. The landing was without further problems on runway 25L. The aircraft then rolled to the parking position. It appeared a part of the left wing flap (Inboard Fore Flap) with dimensions of about 4.5 x 1 m was missing. The fracture was about half a metre to the left of the inner flap attachment. The remaining flap piece was twisted around the inner attachment point and was jammed between the attachment and the fuselage. Two connecting rods between of the front and middle landing flaps were broken or torn out. The outer fuselage skin of the aircraft was penetrated in the area between the fairing outlet and the rear cargo door over a length of 3.5 m. In this area, the ribs showed heavy damage. The missing flap part was located in a forest on December 12, 2009. Conclusions: "The flap fitting was destroyed by a pronounced vibration fracture, which probably originated in a corrosion cavity ." Der Flugzeughersteller als Inhaber der Musterzulassung des Musters Boeing B 747-400 sollte die Korrosionsbeständigkeit der Landeklappenhalter, insbesondere im Bereich des Lagersitzes, verbessern. 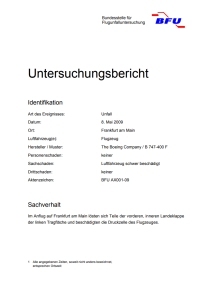 Der Luftfahrzeughalter sollte die an seinen Flugzeugen des Musters Boeing B 747-400 verbauten Landeklappenhalter entsprechend des revidierten Hersteller Service Bulletins (SB) 747-27-2366R3 und des Service Letter 747-SL-57-085-C überprüfen und, wenn erforderlich, austauschen.